I bring you… savory, cheesy and fruity poptarts for cocktail hour! Let’s make them a thing. I mean, how cute are these puffy, flakey squares of love? Adorable, yes. Filled with tangy, creamy goat cheese? Double yes. Filled with a spiked (hello, the best part) homemade cherry peach chutney? Triple yes. If you’re a sweet-meets-savory fanatic like I am, these bites are right up your alley. This summer I’m working with Pernod to create a few recipes using their unique liqueur. I love the anise flavor – it’s one of those flavors that is full of nostalgia for me. I’m instantly reminded of the holidays and flooded with memories of delicious food and dessert. It tastes like HOME. In what could possibly be considered one of the easiest “fancy-looking” snacks, all you have to do is layer your goat cheese and chutney inside the pastry and pinch it together with a fork. 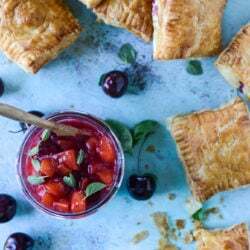 The chutney will take a few minutes to thicken – you’re cooking the cherries and peaches with Pernod over heat – and while that is happening your puff pastry can thaw. It’s super simple! I wanted to create something sweet with Pernod but incorporate it into a savory appetizer that could be enjoyed with an assorted snack plate – something like my favorite cheeseboard or some pickled vegetables. When I think of anise, it’s almost always in *sweets* form. I absolutely can’t get over the cherry peach combo right now and knew it had to happen. 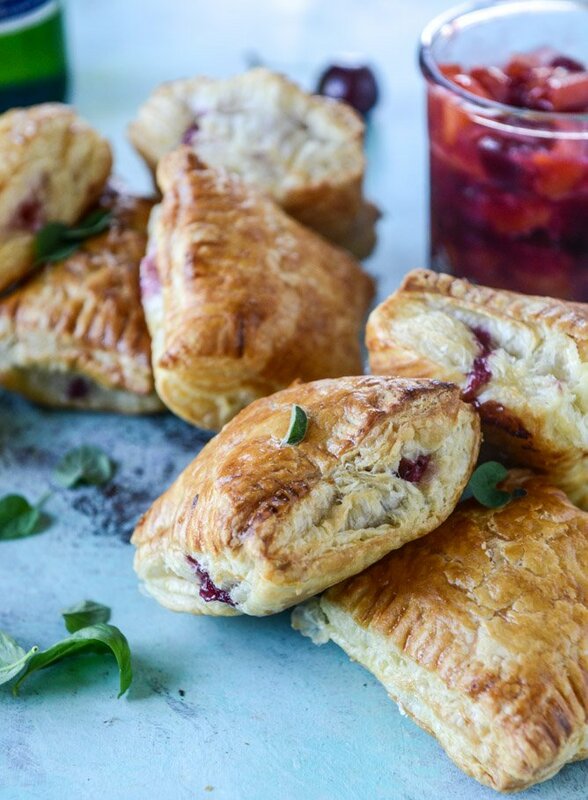 I wanted to make my own jam-like spread that I could fill the puff pastry with, but also use fruits that would taste fabulous with my favorite cheese ever, tangy goat cheese. Plus, ridiculously flakey and light puff pastry goes well with everything! Um, remember back in the day I made a nutella (!!!) s’mores version of these? They are SUCH a hit. Now I just don’t know which I love more! Cheese… or chocolate. Not a fair question at all. Preheat the oven to 425 degrees F. Place the puff pastry sheets on the counter to thaw. Line a baking sheet with parchment paper. In a saucepan, combine the cherries, peaches and cornstarch. Stir to mix. Add the Pernod and heat the mixture over medium-low heat, stirring occasionally. Cook the peaches and berries until they break down, soften and the mixture starts to thicken, about 6 to 8 minutes. If at any moment the mixture becomes TOO thick, you can always add a teaspoon of water to thin it out. Once the chutney has thickened, set it aside to cool slightly. Slice the goat cheese into 9 equal slices. Place them on the puff pastry like you would in a tic tac toe board. Spoon 1 to 2 tablespoons of the Pernod cherry peach chutney on top of each goat cheese piece. Cover the entire thing with the other sheet of puff pastry. Use a large knife or pizza cutter to cut the pastry into 9 squares, just around the edges. Use a fork to press the edges together. Brush the tops with the beaten egg wash. Bake for 20 to 25 minutes, or until golden brown. Let cool slightly before serving. Serve with the leftover chutney! And – hello – that color! Ohhhh you’re making me so happy – I love goats cheese and combined with something sweeter it’s even better! And this sounds like such a nice switch from my usual goats cheese and honey. Love it!! My last payment was $8482 working 11 hours a week online. My sisters friend has been averaging 17k for months now and she works about 21 hours a week. I can’t believe how easy it was once I tried it out. Oh wow!! these sound so amazing. I love the goat cheese and cherry/peach combo. And who doesn’t love anything wrapped up in puffed pastry?! yum! right?! puff pastry is a dream! I have this fantastic puff pastry recipe that I love making and I made extra a couple of weeks ago, so now I know what I’m going to do with it! ???? Oh my goodness, these flavors are so dreamy! I need these in my life! Wish there was a way to pintrest. I havent ventured into it yet. Get out of my head! I’ve been craving homemade pop-tarts for ages and even tried one recipe…but it didn’t quite hit the spot (I think the crust was too thick and pie-doughy). Then you go and make these flaky bites of deliciousness, which I want asap! I am craving a flavor without really being able to put a finger on what it is and THIS!! This is the flavor!! I’m typing up this comment, shutting the computer and heading to the grocery store. These are happening TONIGHT. !!!! Thanks you very much for this delicious and healthy food. I know you’re working with Pernod on this post but any suggestions for a non-alcoholic substitute?